There is an interesting guideline with a conventional Fannie Mae mortgage, where the waiting period to obtain new home financing is based on the bankruptcy discharge date, NOT the foreclosure date when mortgage is included in bankruptcy. This post is for anyone who has ever had a home included in their bankruptcy, and are looking for answers on when they can buy a new home. Let me paint a picture for you to make sure we are on the same page on when this guideline is used. You filed bankruptcy and listed your home and mortgage(s) tied to the home as included in the bankruptcy. The bankruptcy was discharged in 2014, but the home that was included in the bankruptcy was not foreclosed until 2017. Most lenders will tell you that you have to wait 7 years from the foreclosure date before you will be eligible for conventional financing. This is either because the loan officer is unaware or because their company has an overlay that doesn’t allow this guideline. But wait a minute, you surrendered that property in the bankruptcy 4 years ago. The guideline states that when including a mortgage/home in a bankruptcy, the waiting period is based on bankruptcy discharge date, NOT the foreclosure date. This is ONLY on conventional Fannie Mae loan. This guideline does NOT apply on FHA loans. This guideline is for borrowers who vacated the property at the time the bankruptcy was discharged, or around that time. Remember, your intent was to surrender the home as part of the bankruptcy. If you stayed in the home, and were mortgage/rent free for several years, and then expect to buy a house buy using this guideline, there is a good chance the loan will be declined. The guideline is not designed to help if you did not truly surrender the home when the bankruptcy was discharged. If you did vacate the property, and got into a rental, paid your rent on time as promised – this guideline is perfect for you. It is extremely common for lenders to not complete foreclosure proceedings for several years after the home was surrendered in bankruptcy. But this guideline is what saves the day. On conventional mortgage loans the waiting period is 4 years from chapter 7 bankruptcy discharge date. Chapter 13 bankruptcy requires 2 years from discharge date or 4 years from the dismissal date. But if chapter 13 was dismissed, that means the bankruptcy wasn’t completed. This means the debt wasn’t settled per the agreement. So if you foreclose in that scenario, the waiting period will be 7 years. The guideline above states that the lender must obtain appropriate docs to prove that the mortgage was included in the bankruptcy. What does that mean? It’s pretty simple actually (if you retained copies of all your bankruptcy docs, not just the discharge). When filing bankruptcy, there are many schedules (different sections) that are drawn up that identify assets and liabilities that are included and excluded in/from the bankruptcy. With chapter 7 bankruptcy, it is pretty straight forward. If you mortgage was not reaffirmed, your mortgage was surrendered in the bankruptcy along with all of the other debt you listed. Once the bankruptcy is discharged, your obligations are gone essentially. With chapter 13 bankruptcy it gets a little tricky. Traditionally, chapter 13 bankruptcy is considered to be a “reorganization of debt”, enabling individuals with regular income to develop a plan to repay all or part of their debts. You and your creditors agree to new terms on your debt per the bankruptcy terms, and you retain the assets associated with that debt. You make your payments per the bankruptcy and once all of your payments have been made, the debt or delinquency is settled. Some people use chapter 13 bankruptcy as an instrument to actually save their homes from foreclosure. In those cases, typically the mortgage debt that is included in the bankruptcy is any arrearage (past due payments). So the bankruptcy in this case, would act as a tool to help you keep the house while getting caught up on what you owe. In this case, the home would be listed on the Schedule C in the bankruptcy (property claimed as exempt from the bankruptcy). However, there are many cases where the home and entire mortgage is included in the chapter 13 bankruptcy. If that is the case, the home will NOT be listed on the Schedule C (property claimed as exempt from the bankruptcy), and the home is considered to be surrendered. When the home is surrendered in chapter 13 bankruptcy, you may need more than the schedule C to convince the underwriter that the home was in fact surrendered in the BK. This (again) is because traditionally chapter 13 is considered reorganization of debt. Showing additional proof – Each state is different, but if you’re looking to show further evidence of home being surrendered in the bankruptcy, look for a form stating: Chapter 13 Plan and Motions. This will once again declare what is to happen with the real estate, and the debt tied to that real estate upon successful completion of the chapter 13 bankruptcy. If the home was surrendered, the chapter 13 plan and motions will state it accordingly. If it turns out you do not meet traditional lending standards and guidelines, a portfolio loan may be the alternative solution for you. A portfolio loan is a mortgage designed for borrowers who don’t qualify for traditional home financing. Whether the issue is credit related or otherwise, a portfolio loan may be the solution to get you into the home you’re looking to buy while you wait on appropriate time to pass before being eligible for traditional financing. More on portfolio loans here. Keep records of all bankruptcy documents. I cannot tell you how many times I request bankruptcy documents, and all that is provided is proof of discharge. In order to document everything properly (and make an appropriate lending decision), lenders need all documents associated with the filing. This also includes any schedules, amendments, and discharge of the bankruptcy in question. I have seen it countless times. An otherwise “A grade” borrower is left with no mortgage options because their ex-spouse was extremely irresponsible with their finances while going through divorce. Resulting many times in no other option than having to file for bankruptcy, and even foreclose on their home. For these types of situations there is hope! FHA, VA, and conventional guidelines are set in stone. As brutal as it sounds, they don’t really care about the sob story. If you had a nasty divorce which resulted in a bankruptcy, short-sale, or foreclosure you’re pretty much between a rock and a hard place if you have any desire to be a homeowner in the next couple years. So what can you do? You have been a homeowner since you graduated college 15 years ago. Are you really going to be forced to live with family, or rent? NO. Believe it or not, there are lenders out there that take a common sense approach to mortgage lending. Lenders that will look at your situation from a common sense standpoint, and make every effort to understand exactly what led to the circumstances that you’re in. Lenders that will take into consideration that you fell on hard times, but are now back on your feet. These are the lenders that offer in-house portfolio lending. Lending designed to bring common sense back into the home financing world. Where you don’t have to fit inside the little black and white boxes of the strict government guidelines. Imagine that? Being treated like a human being instead of a statistic. What a refreshing concept? So where do you start? The best thing to do is seek out a small-to-mid-size lender, bank, or credit union which offers portfolio loan financing. Find out what their requirements are for these unique loans. Find out what you can do to prepare as best you can. There are still going to be requirements to meet because they want to make sure you ARE back on your feet, and confirm that you do have the ability to repay the loan. You’ll probably be required to put at least 10% down. Points may be required to cover the level of risk they are taking. You need to have a verifiable income. Other situations when a portfolio loan may be your best option: unique property you’re looking to buy, self-employed less than two years, bad credit because of an isolated incident like a work injury, etc. You thought you didn’t have a chance in the world to buy a home, but don’t give up. If you’re back on your feet, and you have at least 10% for down payment, home-ownership may be more within reach than you thought. 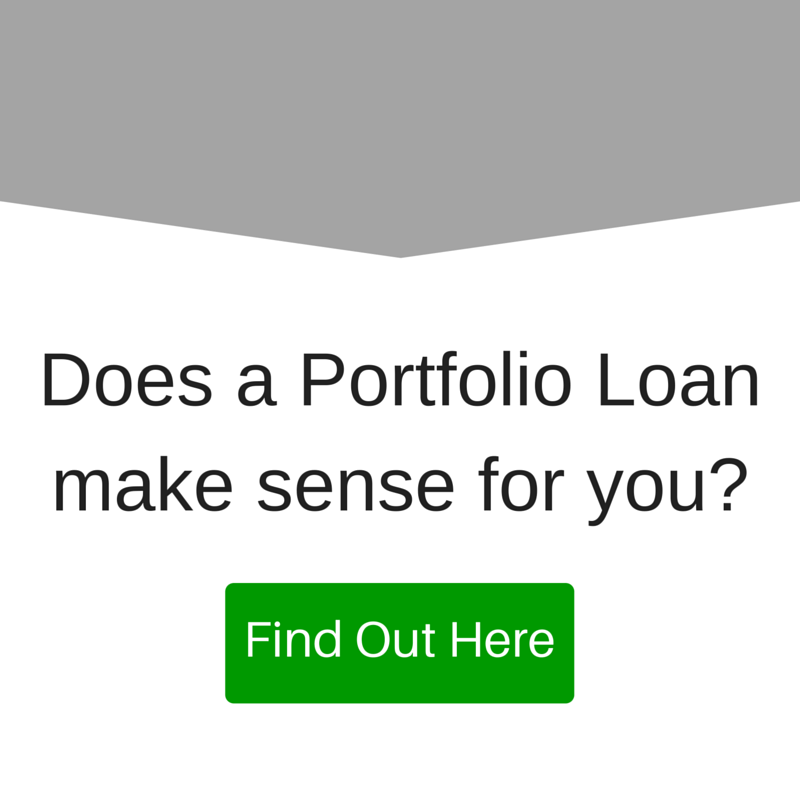 I invite you to reach out to me directly to see if a portfolio loan is the right fit for you. At the very least I should be able to point you in the right direction.